Hoo-rags are revolutionary headwear that are worn by thousands of male and female outdoor enthusiasts and athletes all over the world. If you’re just seeing the Hoo-rag, click the “Watch It In Action” button below for a quick run through of the most popular ways to Rock the Rag. Below we also have a few of the most popular ways you can wear yours, but in reality you can use your Hoo however you want. The Hoo-rag is made of 100 percent polyester microfiber that wicks away moisture and protects you from the sun’s harmful rays! Rated to 30 UPF. Perfect for desert journeys, ranching, sun protection, and paintball, Face Mask style boasts extreme versatility and protection. Cover your mouth and nose with your Hoo-rag to prevent dust, dirt, and non-toxic paint from getting into your lungs. Perfect for partying outside on cold nights or when shredding on the slopes. The Neck Gaiter style is the perfect way to look stylish while keeping your neck and throat warm. No one likes having a frozen neck, we feel your pain. Nothing says sweetness more than rocking Headband style with your favorite design. Wrap the Hoo-rag around your forehead to keep hair and sweat out of your eyes, and make yourself look like John McEnroe. Which is awesome. Wrap your favorite Hoo-rag around your head Alice Rag style to keep your hair up and out of your face on all your adventures. Match it up with your favorite gym clothes or throw it on when there’s just no time to mess with the curling iron. Unlike Alice, you won’t need a looking glass to know how great you look while rocking the Hoo Alice Rag style! For maximum protection from the sun, or maximum anonymity, Balaclava Rag style takes care of business. 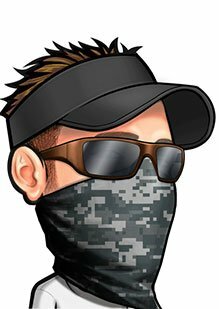 Cover your entire face except for your eyes and achieve complete Hoo-Rag ninja status, a new breed of ninja that wears sunglasses. There’s a little bit of “Arrrr Matey” in all of us, which is why you rock Pirate Rag style. Pillage and plunder in a friendly and responsible way by wrapping your Hoo-rag completely around the top of your head and covering your skull. If you want to keep your hair out of your face and not look like a tiny Chewbacca, try the sweet and simple Ponytailer style. Use your Hoo-rag to tie up your hair, and rest assured that you are rocking the sweetest possible ponytail accessory on the market, and do not resemble a Wookie. One twist will turn your Hoo-rag into a beanie that will keep you as snug as a bug in a rug. Rock the rag Beanie style in colder weather to keep your head and ears covered or under your helmet for a perfect sweat-free fit! Planning a stay in the desert? Keep your head and neck covered in the hot sun and rock the rag Sahara style. Sun protection and moisture-wicking, this Hoo-rag style will keep you calm and cool in even the hottest conditions. If you love the fitted style of the Beanie, but want the neck protection of the Sahara, then the Face Palm style will be your new go-to! Great for slapping on before the gym, a quick cover out in the sun or your new fix for bad hair days. Quick and easy style, 100% moisture-wicking microfiber polyester, the Face Palm has you (and that hair!) covered.